A child’s 1st Birthday is a very special occasion, and while it’s important for both the parents and the child, a child at this age will have very little understanding of what the event means. In the child’s eyes, they will understand that something special is taking place, but they won’t be able to fully grasp the significance of the occasion. A good thing to keep in mind when planning your child’s First Birthday, is that the day holds much more meaning for the parents than it does the child. You don’t want to overwhelm the child with too much activity, so it’s a good idea to keep the party very simple and low key. At only one year of age, your child will still be growing accustomed to the world at large – suddenly thrusting them into the limelight (no matter how proud you are of them) could be very daunting for a one-year old. For a 1st birthday party, it’s best to only invite close friends and family – people who the child is already accustomed to. The child will still understand that it’s a special occasion, and may even understand that the party is all about them, but you don’t want to introduce too many unfamiliar faces as it might unsettle the child. If older children will be present it should be explained to them that the party will be quieter than other parties they may have been to. Arrange activities for the older children, but also let them know that they may have to wait for the child’s naptime before they can begin certain games and activities. Keep the length of the party to a minimum – one to one and a half hours is a suitable length for a one year old. A good idea is to hold the party before the child’s regular nap time, as the excitement alone of something new is enough to tire them out. While you want the day to be special for your child, you don’t want to wear the child out. Likewise with the guests who’ll be present at the party, it’s a good idea to keep any decorations to a minimum – if you choose to use them at all. While balloons are always an attractive option, too much can be simply that for a child – Too Much! There’s also the chance of balloons popping – something that’s sure to scare the child – so it’s sometimes best to avoid them altogether. 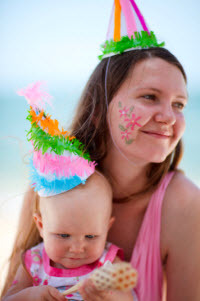 Party themes, while fun, are much more suitable to older children and one year olds may become confused by too many surprise elements. An easy way to make the child feel comfortable, while also letting them know that this day is special, is to keep any decorative aspects in one place. The dining table is the perfect place for this as your child will be able to focus on this one area, while not being literally surrounded by other distractions. Again, it’s a nice idea to keep this as low key as possible while also interesting. Food is very important to a child as they are still learning new tastes, so what you place on the dining table can be decoration enough. You want the child to know that this is a special occasion, but you do not want to overwhelm the child. The child will sense that they are the centre of attention, and quite often that can be all that’s needed to make the day very special for them. Because the special day is all about your child, it’s a good idea to set out food that both your child/children and the adults can enjoy. Try to avoid any new foods for the party, or limit it to one. It might be an idea to provide finger food that the child can also enjoy, then serve adults other snacks after the child is sleeping. This can be a good idea as it not only makes the party interesting for your guests, but also gives the parents a chance to unwind with their friends. 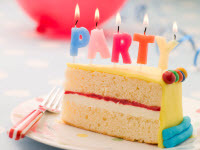 Many parents can often miss out on the chance to socialise during the child’s first year, so the party not only gives everyone a chance to celebrate the birthday, but also for the parents to catch up with friends and family. The Birthday Cake is a great tradition for any celebration, but at this age the cake is mostly for the big kids and adults. If your child/children can't eat the cake - make sure they can have a treat, such as ice-cream, custard, yoghurt or non-dairy treat instead. There are many alternatives to cake that can be just as exciting for the child. Avoid anything that’s too sweet or rich in sugar – remember, the child will only enjoy the day as much as you do, and you’ll no doubt both be tired towards the end. It’s best to keep the party festive, but without interrupting your child’s routine too much. You should always be aware, that certain foods can cause allergic reactions. Always check with everyone beforehand to see if anyone coming is allergic to anything. If anyone does suffer from food allergies, either avoid that food altogether or make sure you have an alternative food for the allergy sufferer. Aside from the risk of a child or guest accidentally eating food they shouldn’t, this also ensures that no one at the party will feel left out. 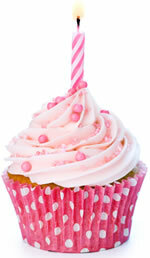 As exciting as they are, Birthday Candles could be very overwhelming for a one year old. If you are going to have a cake for your child, and you decide that you’d like to use candles, it’s a good idea to introduce the child to this before the big event so they’ll be accustomed to it on the birthday. A good idea is to introduce your child to a few small candles. You can do this by setting them in a muffin or cupcake. You still want your child to experience the excitement and wonder of their birthday, so keep in mind that you don’t want to overplay it so that it’s still exciting for them come their actual birthday party. Make absolutely sure that you warn the child against touching them, but don’t alarm them. You want them to be at ease with the sight as it will be a recurring theme in other birthdays. A child will also be very curious about Birthday Candles and may want to touch them, so be sure to set the cake well out of reach from your child. When the cake is brought out, you and the guests will want to sing “Happy Birthday”. It’s also a nice idea to introduce this song to your child in the weeks beforehand, so they’re very familiar with it. Children at this age are very responsive to repetition, so it should be easy to familiarise you child with this song. Begin by softly singing this to your child during times that the child’s familiar with already, such as bath time or when your getting your child to sleep. It might help if both parents sing at these times, singing it a little louder each time the song’s repeated to accustom the child to the future group performance. This way the child can enjoy having the Birthday Song sung to them, but won’t be startled when it’s performed by a larger group of adults. Presents for a One Year Old can be anything ranging from small plush animals to learning toys suitable for this age. Ideally, you want to stick to the rule of keeping things simple for the child. Being bombarded with numerous gifts can also be overwhelming for a child. As it’s the First Birthday of the child, perfect gifts can be those that mark the special occasion – giving both the child and the parents something to remember as years go by. This can be as simple as a special book or a Teddy Bear that family and friends can sign, congratulating the child while also leaving a keepsake for the family. A nice idea for presents can sometimes be to give gifts that are suitable to both parents and child, something that can help make it easier when looking after a child. The quality and ease of the time a parent spends with their child can be just as valuable as toys. A one year old can sometimes be very limited in the types of toys they can be exposed to. If you do buy toys for the child, a good idea is to try and find toys that both the parents and child can enjoy together. This can include many things such as toys for when it’s bath time, interactive toys that can be attached to a pram, or anything else that is practical but entertaining for the time spent with the child. The early years are a very busy time for both parents and children, so anything that can make it easier to keep both happy is a gift in itself. Most of all, the main aim of the day is to have fun! That's often the perfect gift for your child! The ultimate one-stop wrap for a stress free first birthday. Plan the party to last an hour (maybe an 1-1/2 hour) and best on a weekend. At one year of age, babies have a short attention span and run out of energy and interest quickly. Plan the party for late morning or late afternoon, pre- or post-nap. Make sure your guest list is restricted to family and friends. How about a babysitter or a family member to help you balance your hosting duties on the big day. If you do have to have balloons, avoid normal balloons (latex) as they are choking hazards and go with mylar or foil balloons, and hang them out of the child's reach. Loud bangs from party poppers and bursting balloons will frighten a child, so consider leaving them till next year. Create a child-proof play zone filled with age-appropriate toys for your little guests. Set chairs around the zone for parents to relax and watch. Remind everyone to consider guests with food allergies. Keep snacks simple, and more grown-up versions for the adults to munch. It won't matter to the birthday child whether you throw the party of the year or celebrate at home with your family and friends. As long as love is all around (do you hear John Paul Young? ), that's all that matters. Understanding a 1 Year Old! Your one-year-old may be fearful of strangers, and strange or new places. Despite liking other babies, she won't understand how to play with them yet. She will enjoy individual attention and likes to make you laugh. All of which adds up to an intimate, low-budget family party! Bonboniere and gifts are up to you, but at this age the guests are too young to enjoy them. but whatever you do, HAVE FUN!